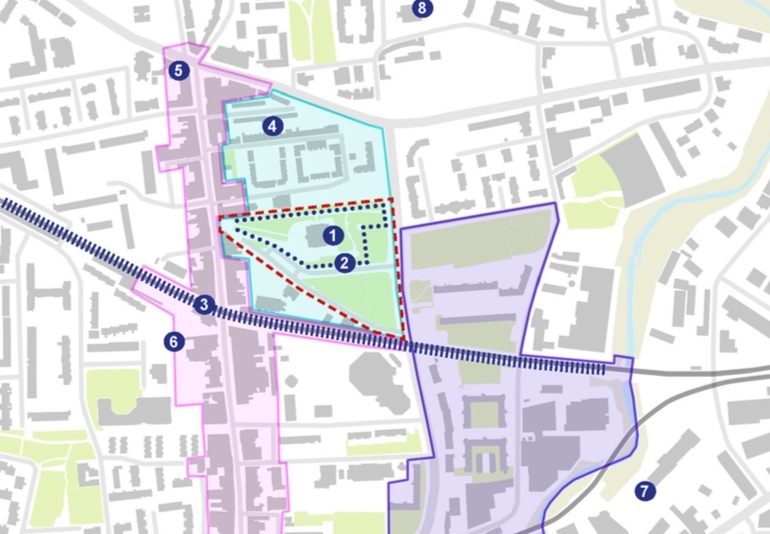 Consultation is currently under way (both in Deptford Lounge and online) on the proposals for reinstatement of the open space on Crossfield St once the Tideway Tunnel shaft construction is finished. At the moment the public realm is a patchy mix of several separate grassed areas (trees having been chopped down several months ago in preparation for the construction work), the remains of the community garden which never really got off the ground, a dropping off/turning circle in front of the entrance to St Joseph's School with a large paved and bollarded area in the middle of it, and various other bits of grass, pavements, hawthorn hedges and so on. The larger, green open areas are pleasant but the rest is frankly a jumble. It's going to be way worse than a jumble for the next few years of course, with hundreds of lorry movements, noise, dust, disruption and so on as the shaft for the tunnel is excavated, but eventually the area will be reinstated and Tideway has been consulting with 'local stakeholders' to develop proposals for this work. 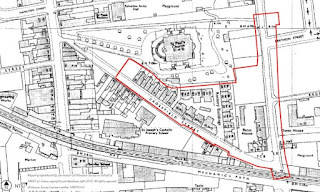 The area in question (inside the red dashed lines on the map above) is part of the St Paul's conservation area, which sits in between the Deptford High Street conservation area and the Creekside conservation area. 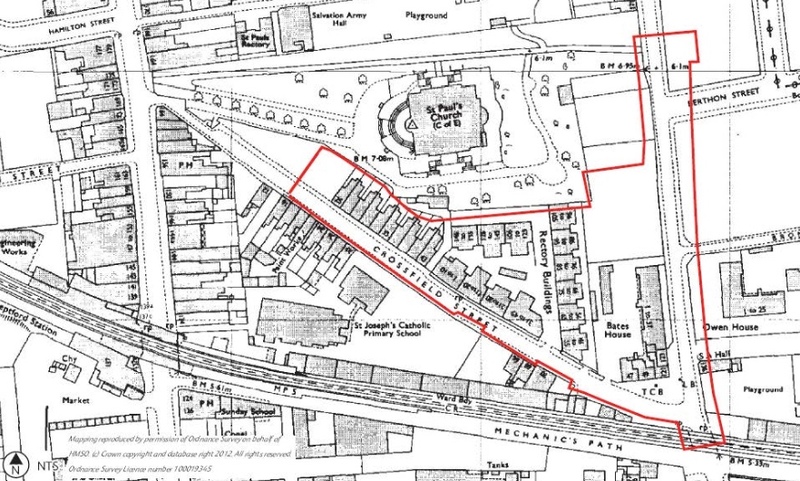 In case you were wondering what was here before, helpfully there's an old pre-1945 map on the exhibition boards that are downloadable from the consultation page showing the houses that lined Crossfields St before the bombs fell and the post-war clearance took place. I wasn't able to go to the consultation in the Deptford Lounge when the staff were there, so I only have the information on the boards to go by. I don't know how fluid or fixed the proposals are, what procedures they still have to go through, or even why the boards have put forward three very different options for the space - which in fact suggests that the 'masterplan' is still very much a work in progress. If that's the case, then great. 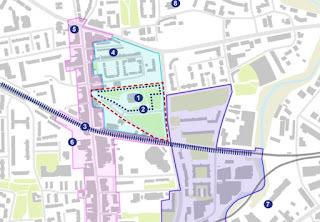 Certain aspects of the 'preferred' masterplan are rather disappointing and I would hope to see them improved. Inevitably there are certain constraints that can't be eliminated - the need for maintenance access to the tunnel shaft, and the presence of some above-ground infrastructure including ventilation shafts will be a permanent legacy. But this still leaves plenty of flexibility to make usable, pleasant spaces. First the good stuff. 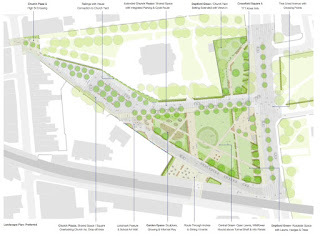 I'm happy to see lots of new trees in the masterplan - let's just hope they make it past the powers that be, and don't have to be eliminated to address 'security' concerns or because they are blocking the vision of the CCTV cameras. The CCTV cameras that are generally worse than useless when it comes to needing evidence of a crime. I like the trees that are proposed down the middle of Deptford Church Street - it's an awful road at the moment which is way too wide and consequently when it's not blocked by stationary traffic it is abused by speeding traffic, depending on the time of day. Narrower lanes and a tree-lined central reservation, with wider crossing points, would help reduce traffic speeds. I also like the proposals to open up the views of the church and access to the churchyard, so that it is more welcoming to the community. The rear gate of the churchyard is kept locked these days, which means I rarely go inside the walls - when it was open I regularly strolled through it. 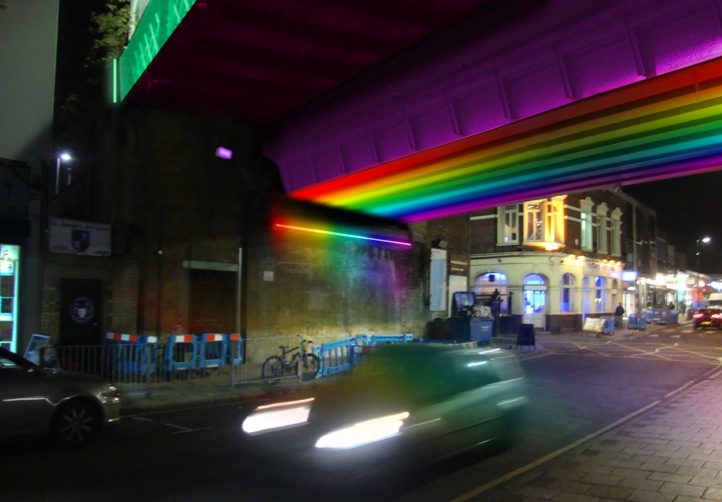 One long-term aspiration for pedestrian links in Deptford has been opening up access through the railway viaduct to Resolution Way and Wavelengths, and that's shown on here with the front of the viaduct proposed as a 'dining and events' space. I assume one of the arches would be opened up on this side to accommodate a cafe/bar premises, although there is probably enough space for a purpose-built premises on the land there. What I find particularly disappointing is the way in which the central green space is criss-crossed by so many footpaths that its 'green' purpose risks being completely eroded and the space turned from a grassy play area to a network of paths with a few bits of green in between. 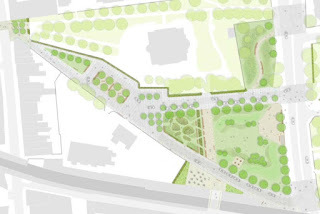 For a start the long footpath that runs parallel to Crossfields St, right through the middle of the green space, seems redundant - surely people would walk down each side of the green if they were passing through, and planting could be used to encourage that? If they are happy to linger, they won't necessarily want to go in a straight line. Not only that, retaining highway access and associated parking on both sides of the green space is totally unnecessary in my view. Why not close one side off and claw back more space for greenery and for pedestrians? It seems a retrograde step otherwise. And how about some greenery at the west end of the street, outside the school? I don't like the fact that it's all been paved rather than greened; seems to suggest that the council has longer term plans for this area than they are willing to admit. There are lots and lots of trees but they seem entirely undefended from the vagaries of the drivers dropping their kids off at the school or parking to go to church. We've seen on Frankham St how little respect drivers have for trees, and learned that serious protection is needed, so I hope those lessons learned will come into play. I think there's a real risk of this space becoming 'over engineered' and turned into something that needs too much maintenance and is ornamental rather than useful. I have the distinct impression of the site being divvied up into packages of land each designed and labelled for a specific use rather than any effort being made to create a pleasant space that is adaptable to a range of uses. I do think there is more potential in the alternative options that are included on the boards, although there's no annotation so I'm having to go by the pictures alone. This one seems a lot less formal and structured, and also retains more green space at the west end of the site although there's still too much space given over to vehicles in my opinion. If you didn't manage to attend the consultation in the library, you can still give feedback online at the survey page here (but only until next Tuesday 23rd May) or presumably you could also send it to the email address that's given on the consultation page. As to what the next phase of the process is, either in terms of the procedure or the timescale, again I don't have that information. If anyone knows, please leave a comment and I'll follow up. 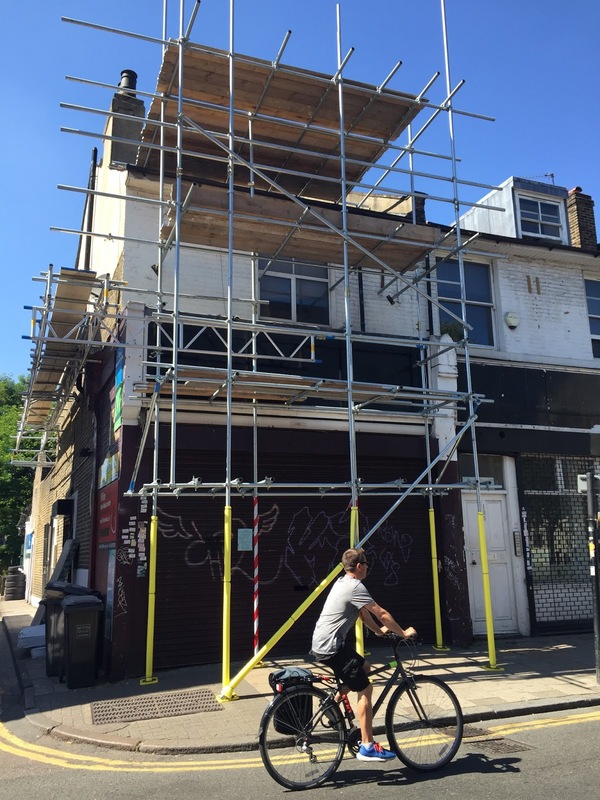 As Deptford residents approach consultation saturation point, news of another consultation. Plans to redevelop Sun Wharf (which currently houses Cockpit Arts and Jones Hire) were first announced more than a year ago and I wrote about them at the time. 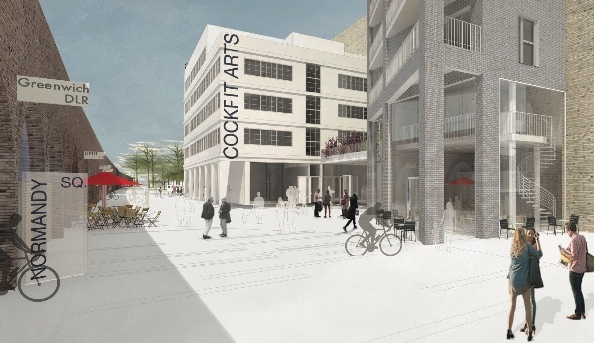 Apparently these proposals - for 'a mixture of commercial space intended for affordable artist studios, new homes, a new public square, and opening up a new pedestrian route to Deptford Creek - have been developed further and new proposals are now ready to be 'consulted' on again. Who gave this job to the freelancer who's still chasing payment for their last invoice? 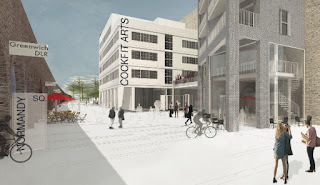 With the existing Cockpit Arts building set to be demolished, the proposals include providing a new purpose built home for the long-established Creekside organisation. Hopefully whoever designs the signage for the new building will be a bit more conscientious with the spell-checking than the person who mocked up the rendering above. Apart from getting the name wrong, looks quite nice and fluffy from this angle. Here's a more realistic and helpful overview of the density, taken from the developer's website. Plans will be on view at the Creekside Discovery Centre on Wednesday 24 May and Thursday 25 May from 4pm - 8pm. Proposals to commission a lighting installation to brighten up the underside of the railway bridge over Deptford High Street have reached the consultation stage. As part of the high street improvement works artist Peter Freeman has been commissioned to come up with some designs for the site - a stretch of the street that is home to twin telephone boxes and usually only loved by buskers and beggars seeking shelter from the rain. Three different lighting schemes have been proposed (details can be downloaded here) and all three renderings show them with rainbow lighting although the proposals are for colour changing lights to be programmed based on three different scenarios. The positioning of fixtures and direction of the lighting also varies between the three. 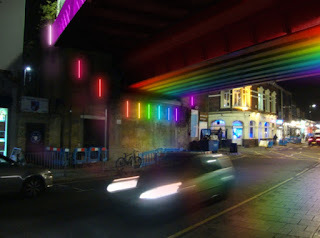 Rainbow bridge: 'rainbow effects with different colour combinations for each month of the year' (I assume this means the same colours just in a different order). 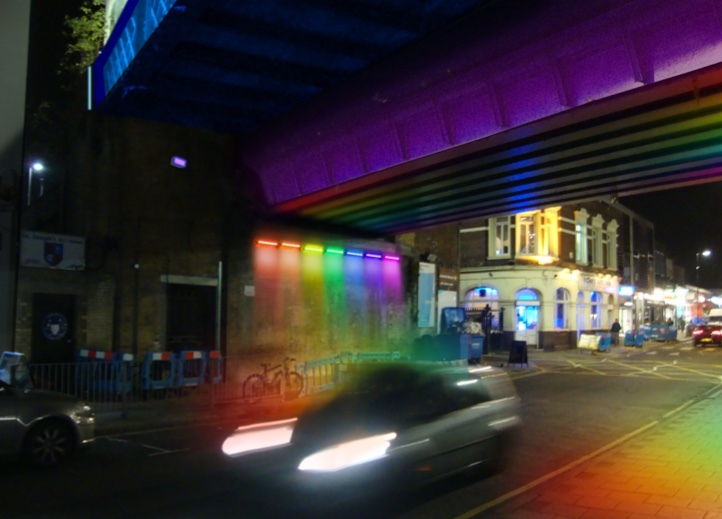 Birthday bridge: 'colour combinations chosen by local residents and school children to honour their own birthdays. The birthday list could also include the birth dates of loved ones and locally famous residents from the past'. The online consultation is open until 26th June and proposals will also be on show at a drop-in session with the artist at Deptford Lounge on 23rd May from 3-7pm. 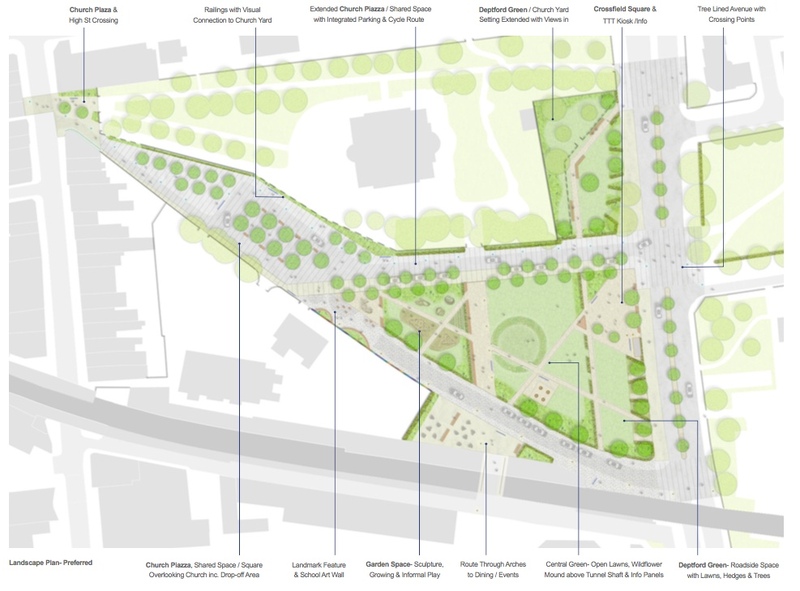 Proposals for the reinstatement of Crossfield Street open space after the Tideway Tunnel work has been completed are on show at Deptford Lounge for a week from today Saturday 6 May. Council officers working on the project and representatives from the design team will be available to answer questions and talk about ideas for the space on Wednesday 10 May from 4-7.30pm and Saturday 13 May, 9.30am-12noon. 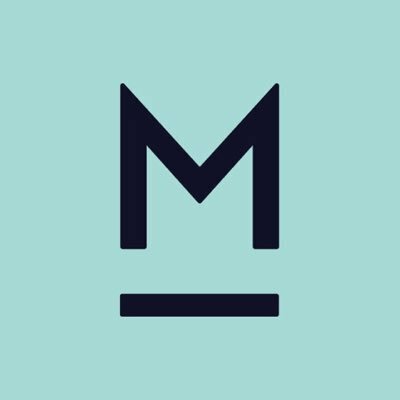 Another new restaurant coming soon to Deptford High Street; Marcella is the sister restaurant to Artusi in the peak-hipster Bellenden Road district of Peckham. A road that used to describe itself as being in East Dulwich. Marcella has been bubbling under for some time, with the former Vietnamese restaurant on the corner of Ffinch St undergoing an extensive refurbishment over many months. I've been following progress impatiently. Looks like it will finally be opening this month, according to the website. It describes itself as 'Italian inspired' and if it's anything like the Peckham original, the menu looks interesting and reasonably priced by London standards. I do have a bit of a backlog on the eatery reviews at the moment, but as long as I am able to fight my way past the Guardian/Time Out/Evening Standard restaurant reviewers and journos who according to Twitter are now flocking to Dirty Deptford's streets, I hope to post a review in due course. If you're popping down to have a peek, don't be fooled by its neighbour. This is not another eatery - it's an estate agent; we've got almost as many new ones of these as we have eateries! They have been a little premature with the gaudy sign as there's no indication it will be ready to open in the immediate future. But if the streetlights should fail at least you'll be able to find your way down the road by the glare of its fluorescent green glow.